This is the first in a series of posts, in anticipation of His Holiness Sakya Trizin’s visit to the Dechen Community this summer, recalling the previous eight visits of His Holiness. 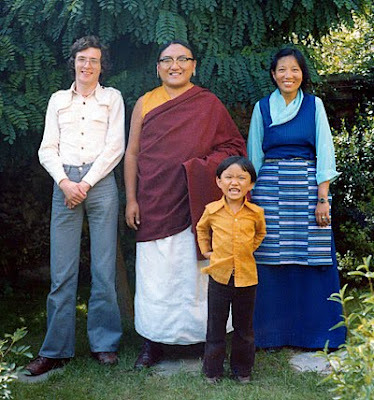 Lama Jampa Thaye first met His Holiness Sakya Trizin in London in June 1974. Subsequently, Lama Jampa was urged by Karma Thinley Rinpoche to invite His Holiness to the UK following the founding of Sakya Thinley Rinchen Ling in Bristol in 1977 by Karma Thinley Rinpoche. Thus in August 1978 His Holiness, accompanied by his wife, Dagmo Kusho-la, and son, H.E. Ratna Vajra Rinpoche, visited Sakya Thinley Rinchen Ling. As part of an extensive programme of teachings, His Holiness gave the Initiations of Manjushri Sakya Pandita and the Union of the Great Compassion and the Great Seal, as well as Vajra Varahi and Mahakala from Bari Lotsava’s famed Collection of Sadhanas. Following this, His Holiness gave 2 days of teachings on the Triple Vision, the first part of the Path and Its Fruit (Lamdre). To conclude the visit His Holiness gave the meditation transmission of Tangtong Gyalpo’s famous sadhana of Chenrezik. This sadhana, as well as the sadhana associated with the Union of the Great Compassion and the Great Seal, forms the core part of the puja programme for all Dechen Sakya Centres.